» Can the Philadelphia Eagles Fly Right? To paraphrase the great Russian novelist and 46 defense pioneer Budski Ryanovich: All good football teams are alike; all bad football teams are bad in their own way. This is particularly applicable to the Philadelphia Eagles, who take a 1-4 record to Washington on Sunday in an NFC East clash with the Redskins. I don’t think I’ve ever seen a football team be bad in quite the way the Eagles are. The reasons for the Eagles’ paltry record, made all the more ulcer-inducing or mirth-producing (depending on where your rooting interests lie), are at once mysterious and completely obvious. The mysterious part? Well, look no further than coach/party leader Andy Reid. According to Reid, the problem with the Eagles is him. Reid has always been fond of post-loss self-crucifixion, even when things were going well for Philly. After Sunday’s Eugene O’Neill play of a loss to the Buffalo Bills (it was like a Eugene O’Neill play because it made me drink a lot), Reid uttered what is something of a press-conference mantra for him: “There’s nobody to blame but me. This season, Reid is in danger of throwing out his back from the amount of sword-falling he’s doing. For four straight weeks, following four straight losses, Reid has tried to shield his team from criticism while shielding the hungry Philly sports media from finding any kind of narrative. It’s nice to see all this back-getting and ride-or-dying. But it doesn’t really take into account how infuriating it is for the easily infuriated Eagles fans to have their intelligence insulted every week. Eagles fans might throw batteries at people they don’t like, but they do understand football, and they can see what’s wrong with the team. They just want Reid to acknowledge it, even if it puts a little heat on certain players and certain coaches. Which brings us to the obvious part. It is obvious to me, you, everyone we know, and any sentient creature that the Eagles do not have the right personnel to run the wide-nine defensive scheme that they are employing. They have an embarrassment of riches at cornerback, yet seem to be utilizing their best corner, Nnamdi Asomugha, in a freelancing Charles Woodson role. Dominique Rodgers-Cromartie is, I think, a nickelback (I say “I think” because I hardly ever notice him on the field). Asante Samuel is not getting the picks he did last season, and he’s not tackling at all (like he did all seasons). And speaking of tackling, the Eagles linebackers simply cannot tackle. Anyone. Ever. After Sunday’s loss in Buffalo, the Eagles spent the week denying rumors that they were bringing on a defensive consultant to help Juan Castillo. Several names were bandied about (Jeff Fisher, Chuck Cecil), and Eric Mangini reportedly turned down the job. (He later denied being offered it in the first place.) 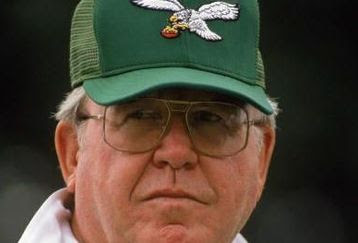 Operating under the where-there’s-smoke-there’s-fire theory, you have to assume this idea was at least kicked around by the Eagles’ brain trust. And if it wasn’t, it definitely should have been. The Eagles’ sheer heart-attack offense — with its red zone allergy and propensity for turnovers and frequency of quarterback-killing, missed-blocking assignments — is problematic and probably not Super Bowl-caliber. But I don’t know if this defense could keep Ole Miss out of the end zone. And this is a problem that has been coming since the death of longtime defensive architect Jim Johnson. Defensive coordinators make a difference. Ask the players who play for Dom Capers, Rex Ryan, or Chuck Pagano. Players played for Jim Johnson. Andy Reid should know this, because the reason his players haven’t thrown him under a SEPTA trolley in the press is that they play for him. He has their back and they have his. And even though he doesn’t know how to manage a clock or challenge a play, they know (against all odds) he can plot a winning season and call a decent to very good offensive game. The fact that Reid doesn’t recognize the need for this same kind of trust, this same kind of allegiance to a coach, on defense may be his biggest mistake of all. And it may wind up costing him his job.